Published: Oct. 7, 2018 at 07:16 p.m.
San Francisco 49ers quarterback C.J. Beathard finds wide receiver Trent Taylor open for a 1-yard touchdown. Published: Aug. 18, 2018 at 08:40 p.m.
San Francisco 49ers quarterback Jimmy Garoppolo finds San Francisco 49ers wide receiver Trent Taylor for a 2-yard touchdown reception. Published: Dec. 24, 2017 at 06:48 p.m.
San Francisco 49ers quarterback Jimmy Garoppolo delivers an off-balance pass to wide receiver Trent Taylor for a 5-yard TD. 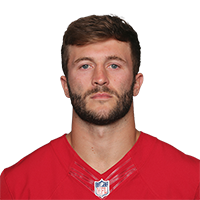 Published: Sept. 21, 2017 at 11:39 p.m.
San Francisco 49ers quarterback Brian Hoyer fires it through the middle to tight end Trent Taylor for Hoyer's second touchdown of the night.